Your Career… Your Job… Your Guam. Guam has something for everyone. 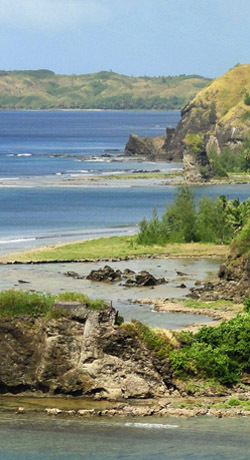 The unique Chamorro culture and language is a blend of Spanish, Micronesian, Asian and western influences that have inhabited Guam for the past 300 years. Experience history and living traditions with visits to the many historic sites, or by sampling some of the delicious food. Guam, an island territory of the United States, is located 900 miles north of the equator in the Western Pacific. From four to eight miles in width and 32 miles long. Guam covers approximately 220 square miles – the largest island in Micronesia and the gateway to the region. It is approximately 6,000 miles from San Fransico; 3,800 miles west of Honolulu; 1,500 miles south of Japan; 1,596 miles from the Philippines and 2,026 miles east of Hong Kong. The southermost of the Mariana Islands, Guam shares a common culture with the rest of the group, which also includes Saipan, Rota, and Tinian. The island was created from the peaks of two ancient volcanoes that sank into the sea and were fused together millions of years ago. Remember if you have questions regarding Guam, the hospital facilities, or anything else that could cross your mind, give us a call. These travel nursing job opportunities in Guam usually go fast, so be sure to check back regularly.